Wanna see more socks? 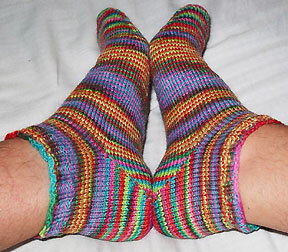 I made a pair of toe-up ankle socks for myself when I was at the Crotch in September, using Bernat Hot Sox. I really like the colours on the short-row toes and heels, but I don't like what happened in the feet: wide spirals of orange/green and blue/pink separated by thin muddy pools. Still, they are evidence that I've short-rowed! And they're comfy round-the-house socks. Let's take a closer look at one of those short-row heels, shall we? That's right: evidence of my adequate short-rowing skills and evidence that I fancied myself really freakin' cool at sixteen when I got this teeny tattoo on my ankle. It's a peace symbol, if you can't tell. (It's surprisingly difficult to photograph your own ankle -- try it!) Good lord, I've had it nearly half my life now. Speaking of tattoos, the KniTattoo Gallery is growing all the time. (Look, Mom! 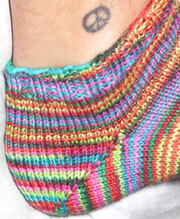 Lots of knitters have tattoos!) So is the Rock-Along Gallery, which was updated just today. Keep 'em coming! And rock on.